Staff and clients visiting the Rand Merchant Bank Academy at 3 Merchant Place, Sandton are greeted by the Seat of Learning – a larger-than-life chair, raised on a plinth, intended to literally and figuratively ‘elevate’ the joint concepts of learning and knowledge. 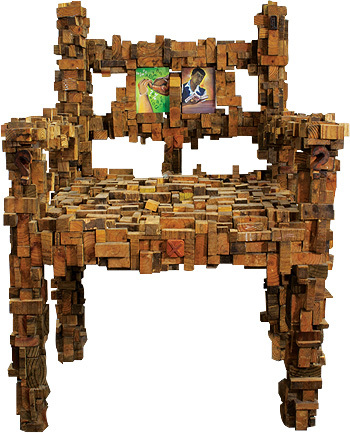 Created by artist Diane Miller and assisted by Cosmas Marimbe, the Seat of Learning was crafted from recycled wood and steel and is intentionally kept vacant – an open invitation to all who are eager to learn. Eleven embroideries from the Intuthuko Group from Etwatwa township, Ekurhuleni form part of this installation. The embroideries speak to the importance of teamwork and of listening to diverse viewpoints when forming an educated opinion. The embroideries are framed as old ‘slates’ or school blackboards and carry messages about learning in South Africa’s eleven official languages. An additional, large blackboard invites others to leave a comment, engage and be part of the learning journey – many minds are always better than one!